If you want to keep your teeth from being damaged, then you need to guard your teeth from developing cavities. Cavities can create structural flaws for your teeth that can result not just in irritation and pain but can also necessitate the entire removal of the tooth. So what can you do to keep cavities from forming and what happens when you already have one? 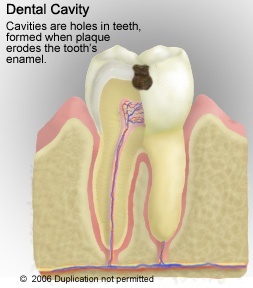 What happens to the tooth when cavities start to develop? Basically, the dental enamel, which is found on the outermost layer of each tooth, may be hard but it dissolves with lengthened exposure to acids. When the acids inside your mouth begin to accumulate, such as when you do not brush your teeth for prolonged periods of time, the enamel layer would slowly begin to wear off and you will get holes on the tooth and eventually cavities. What happens during dental check-ups? Dental check-ups are important because they allow your dentist to find out if there are any cavities which have developed on your teeth. This can be done mechanically through a tool or through dental x-rays. Your dentist would also perform an oral prophylaxis procedure, which basically cleans the surface of your teeth and get rid of hardened plaque in the form of tartar. What happens when you have early signs of cavity formation? If you develop the early signs of cavity formation, then what can help preserve the structure of your tooth as well as prevent the cavity from developing further would be the drill and fill procedure. Your dentist would essentially fill the cavity in with some filling material so that the bacteria would be sealed out of the tooth, and the cavity cannot develop deeper into the sensitive tissues anymore. What happens when the cavity has gone all the way to the pulp layer? The pulp is the source of all the nerve endings, which can translate sensations into pain. So when the cavity has gone all the way to the pulp, then expect a lot of pain. In the case of chronic toothache, your dentist would extend two options. The first one is to remove the tooth completely, while the second option is to go for a root canal treatment. While the first option is final and would leave you with a gap in your smile, root canal treatment basically kills the tooth but still saves the structure of the tooth by removing just the pulp layer.